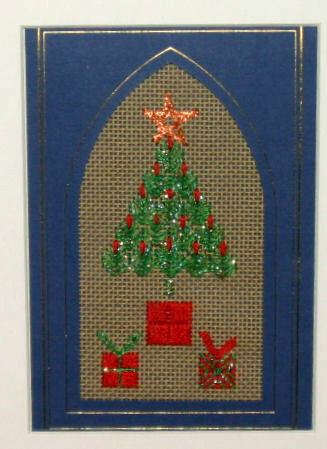 The pattern Carol used for the tree and presents is from the Anne Pearson book, The Complete Needlepoint Count. Carol also gave me a copy of the book which I greatly appreciate as it has a lovely photo gallery of numerous stitch (most new to me) and detail instructions for those stitches. But back to the Christmas card. I quite like this pattern, I have framed Carol’s stitched piece and card, using a white mat, to be 8 inch x 10 inch, it is placed on a cute metal scroll easel that I purchased on Amazon for about $12.00. The metallic threads that my sister use nicely sparkle in the morning sun light. The copper star that she stitched adds a nice surprise of color to the finished piece. The window card Carol used is from Nordic Needle. The card is sized at 4.5 by 7 inches, with a 2.9 inch x 5.4 inch Gothic arch opening.